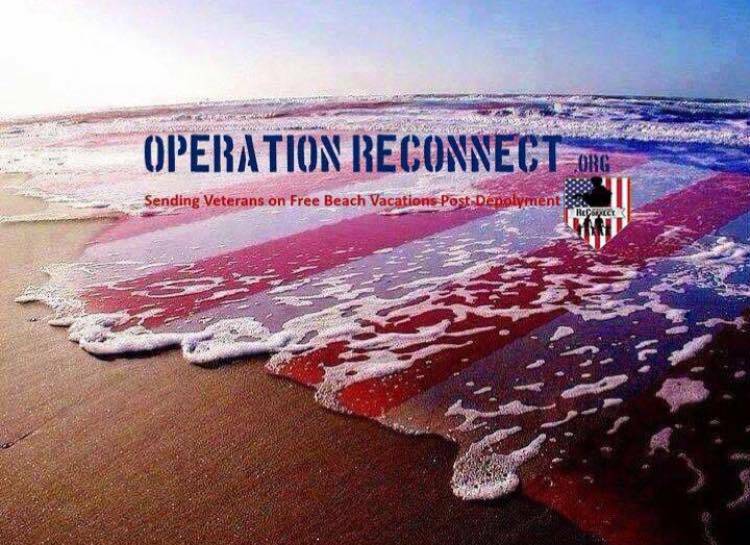 Operation ReConnect is once again partnering with the City of Orange Beach, Alabama to bring Post 9/11 Combat Veterans to the beaches of the Gulf Coast during April 6-13th, 2019. We can't do this alone! With a goal to bring more than 100 military families, the opportunities to be involved are endless. Operation ReConnect’s goal is to host 100+ military service members from all over the U.S. and their families for a full week to ReConnect after just returning from a multiple-month overseas Combat Deployment. After testing this “large group” scenario in 2018 during “Fighter Wing Week”, we learned how important this week is for each and every family that has the opportunity to participate. Having served more than 50 families in 2018 during FWW, we are eager to apply what was learned from last year to this years “ReConnect Week - Spring 2019” scheduled for Saturday, April 6th - 13th, 2019. With the continuous support we receive from the City of Orange Beach along with many local businesses, together we can show our pride and support for those who sacrifice so much to keep the United States of America safe. The Operation ReConnect Team can not do this alone. 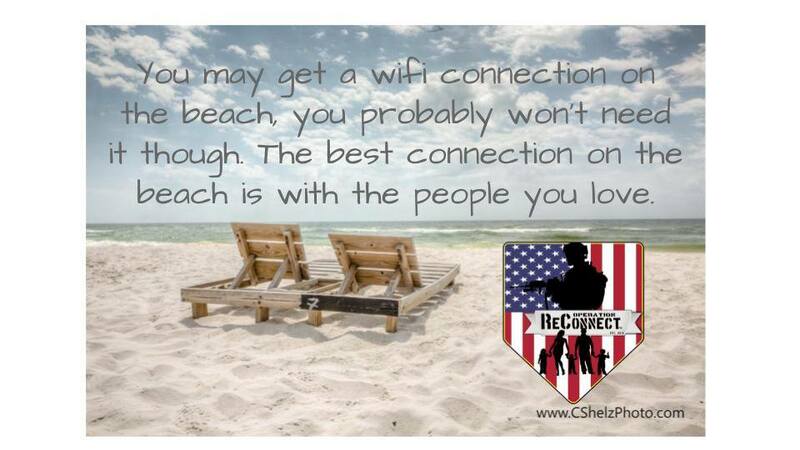 Over the past three (3) years, Operation ReConnect has worked seamlessly with both individuals and rental management companies to bring close to 500 military families to our beautiful beaches in Southern Alabama & Northwest FL. The 'gift of time' we provide to our service-members and their families upon returning from overseas, is absolutely invaluable. This no-strings attached time, allows for families to have the opportunity to relax and reintegrate on their terms. Whether you are a Post 9/11 Combat Veteran, Coastal Property Owner, Property Management Company, a local business or just an individual who would like to get involved: There are a wide-ranging assortment of opportunities to engage. Please do not hesitate to contact us if you have an idea or suggestion that will enhance this experience for the military families we serve. To register as a Post 9/11 Combat Veteran for “ReConnect Week - Spring 2019”, please use the above ‘Veteran Application’ link. To donate your coastal property for use during “ReConnect Week - Spring 2019”, please use the above ‘Donate My Property’ link. To donate business services, gift cards or other discounts to “ReConnect Families”, please use the above ‘Business Donations’ link. You’ve served our Nation. Allow us to serve you and your family. We will keep this very simple…………. Are you a Post 9/11 Combat Veteran? Do you and your family need Time Together in a beautiful Gulf Coast location? Are you available Saturday, April 6th - 13th, 2019? If you answered YES to all three (3) questions, you are in the right place! In May of 2018, Operation ReConnect (with support from The City of Orange Beach and many other community partners) had the honor of hosting more than 50 military families who were just reunited after a multi-month deployment to Afghanistan. The overwhelmingly positive response we received from the families we served and the community members who participated has led us to make the decision to make it even better in 2019! It is with gratitude that we are officially announcing “ReConnect Week - Spring 2019”. This 7-night, completely uninterrupted time (no briefings or sales pitches of any-kind) with your family is scheduled to take place from Saturday, April 6th - 13th, 2019. 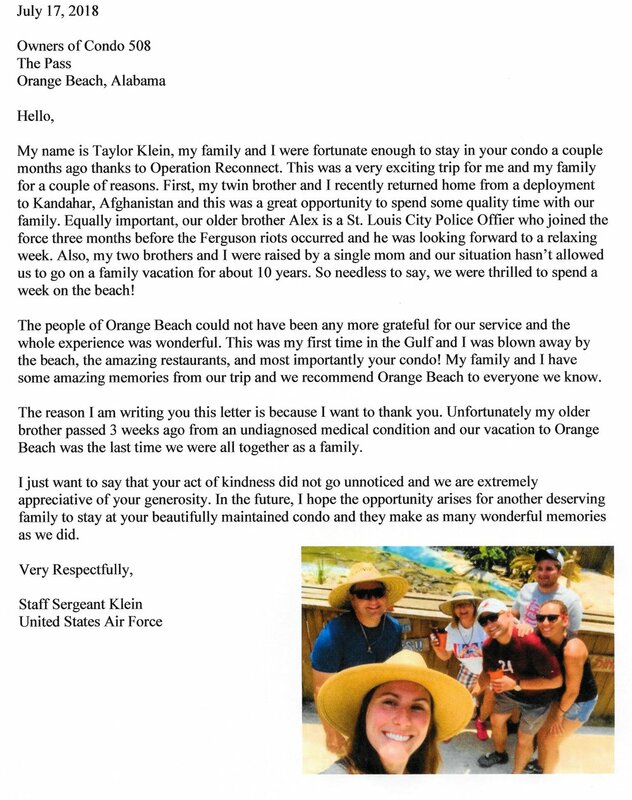 It is our organizational goal to bring 100+ military families to the City of Orange beach and surrounding communities. If you are interested and will be available APRIL 6 - 13, 2019. please complete the “ReConnect Week - Veteran Registration Form” link below. Once your information is received, you will receive a registration response with further details. FULL DISCLOSURE: Our selection process is based several variables with the “Date Returned” carrying the most weight. The most recent returning deployers (within the last 12 months) always have priority in the Operation ReConnect program. Business Donations can only be described as the extra bit of magic that our family’s don’t see coming! Whether you have the ability to donate an entire service or a percentage (%) discount, Operation ReConnect and our families truly appreciate your generosity. Our mission is based around providing our military families with 100% no-strings attached, no-cost lodging for a FULL 7-nights. 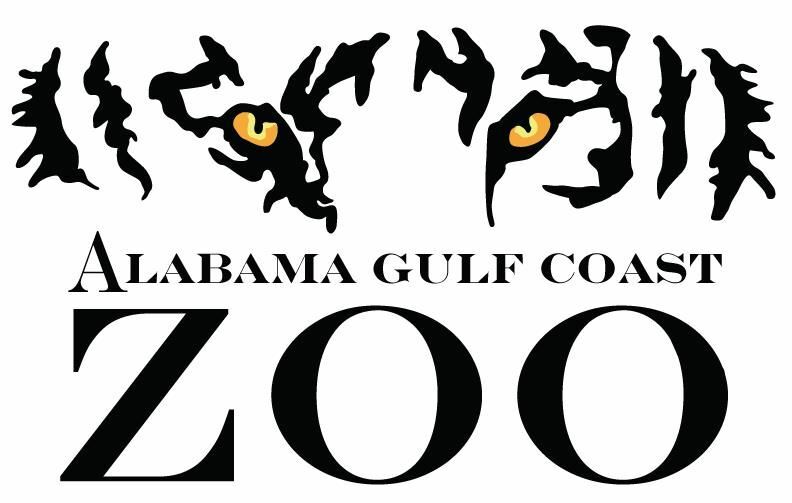 Adding outdoor recreational activities, entertainment, meals or even natural/historic landmarks provides our families with an unmatched opportunity to truly experience the Alabama & NW Florida Gulf Coast.